See the important stuff larger. 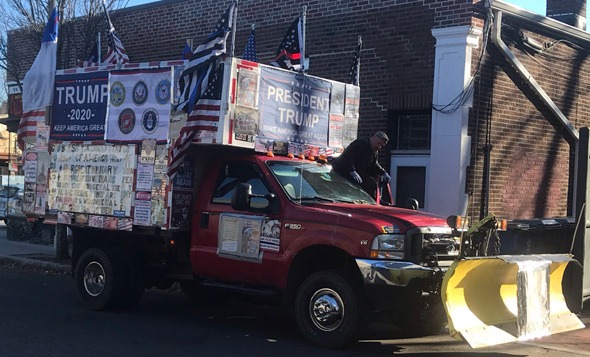 Several people report spotting some pickup plastered with MAGAcrap - and boasting a plow - being driven around areas today where it's sure to make people cry, like Brighton and Cambridge. Joe Wright got a picture of the pickup and the man behind the stickers in Cambridge, between Harvard and Porter squares. He adds: Read more. The MBTA reports delays of up to 15 minutes on the Red Line southbound due to a train with "a mechanical problem" at Porter. CPD units were dispatched to a disturbance in Porter Square, where a male confronted a female for littering and she exited her car and threw a liquid at him. The liquid actually struck two men and one man thought the other male had thrown the liquid and punched him. Transit Police report a man died on the outbound side of the Red Line past Porter Square after he was hit by a Red Line train around 7 a.m. Read more. The MBTA reports an inbound Red Line train died just after leaving Porter and that people were ordered out of the train behind it so it could "rescue" the deceased train. The MBTA reports a train with mechanical issues at Porter is now gone to wherever trains with mechanical issues are sent, and service is back to normal on the Red Line. Red Line goes bust, which line can you trust? The T had to send in a rescue train to push a dead Red Line train out of the way outbound at Porter Square. Even with it now out of the way, there are still 25-minute delays on the line. A track fire just past the inbound side of Porter Square on the Red Line around 9 p.m. bollixed service tonight long after Cambridge firefighters extinguished the blaze. Roving UHub photographer Pat Quintin stopped roving long enough to enjoy the sunset over Porter Square yesterday evening. Michael Doyle is among the scores (hundreds? thousands?) of Fitchburg Line riders forced to deboard prematurely at Porter Square this evening due to either some sort of switch problem between there and Belmont or a train that gave up the ghost, depending on which MBTA alert one chooses to read. Regardless of the reason, "no outbound train has left Porter in 90 minutes," Saul Blumenthal reports. Cambridge Day reports and takes a look at efforts to increase bicycle infrastructure in Cambridge. Green Line workers are currently trying to haul away a dead trolley at Cleveland Circle. Their counterparts on the Red Line are doing the same thing with a dead train at Porter Square. Delays abound. The MBTA reports its managed to dispose of the train that died near Porter Square, but that there are still "minor" residual delays because of it. Matt Cocco estimated 50 people waiting for the Porter Square Zoots to open one last time so they can get their clothes back - which had gone into limbo when the chain went bankrupt and locked all its doors a couple weeks ago. The MBTA reports "minor" delays from a non-moving Red Line train near Porter Square. 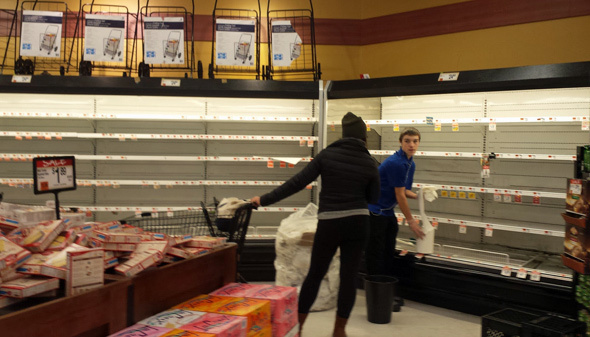 Lisa reports the cream, cheese and yogurt shelves at the Porter Square Star Market were empty today, not because of a frenzied rush by storm-maddened shoppers, but because something made the power go out to that section of the store and workers had to throw everything out. The MBTA reports the dreaded "severe" delays on the Red Line due to a train that gasped its last at Porter Square. 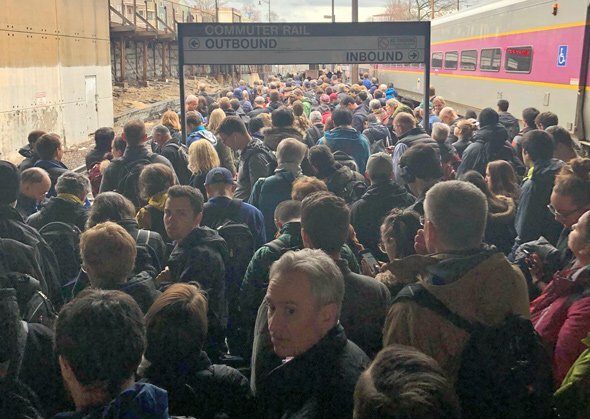 Porter was a good place to die, a Red Line train decided, and now there are "moderate" delays on the line, the MBTA reports. The MBTA reports "moderate" delays on the Red Line due to signal issues at Porter Square. Ben Chan reports his normal 25-minute commute from Quincy took an hour this morning. Commuters like myself are frustrated and pretty annoyed. 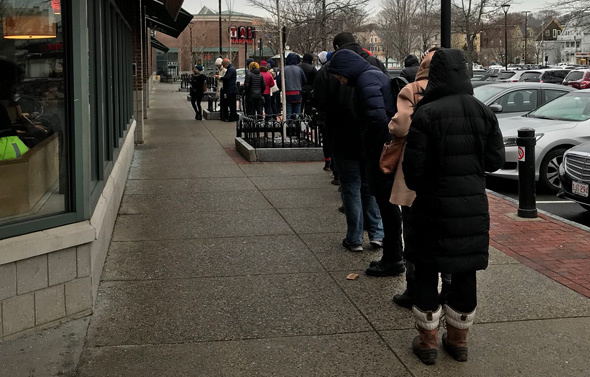 Karene Hines shows us a typical Saturday-morning scene at Bagelsaurus in Porter Square.